Saddle: Just SW of the peak at its base, the map says 2421m. 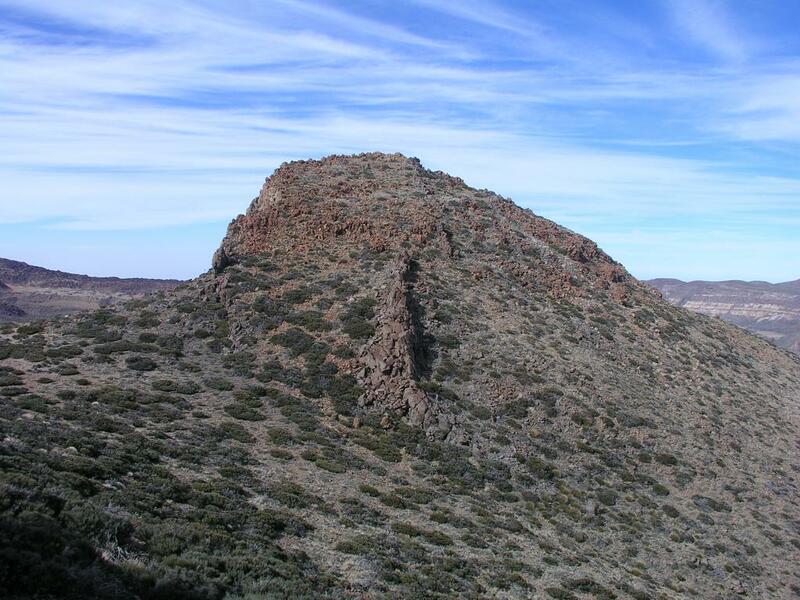 Route description: From Roque de la Grieta, this peak is located about 1.4 kilometer further to the north-east along the rim of the caldera. 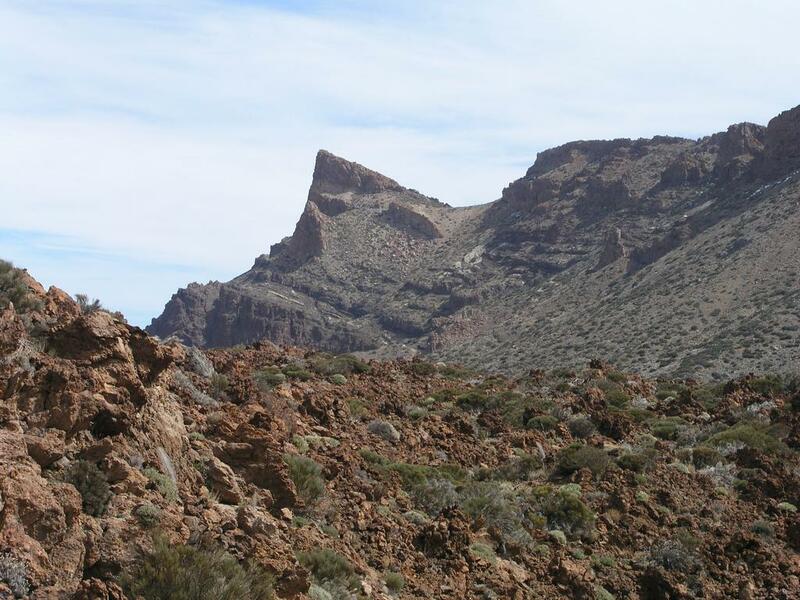 First, descend from the highest point, then go visit the subsidiary point about 200 meter along the way (see the description under Roque de la Grieta), then descend to about 2475 meter to a small saddle. There is a small "hump" further along (elevation 2497 meter) with a primary factor of only 22 meter. Traverse this and descend to the saddle at 2421 meter just before Topo de la Grieta. There is a rock band across part of this descent, an easier route is to go a bit right just before the descent to the saddle. From this perspective the peak looks the least impressive, however you will soon stand on the edge of a 400 meter vertical drop providing a very fine view of the caldera as well as of the rim that you just traversed. Pick your way up the fairly gentle slope to the summit. This part of the route is (YDS) class 2 (off trail hiking with a few obstacles and/or a bit of route finding). In order to end the traverse at this point, one should descend back to the 2421 meter saddle. From there, one can descend to the dirt road in the caldera. In order to do this, descend down the wide gully on scree, then traverse down across to the left. Continue through broken terrain on a general line that descends towards the left. Avoid several steep ravines more directly below. Aim for the slope that clearly connects to the road ahead. The difficulty of this descent can be kept at (YDS) class 2. Towards the end, you may just complete the route in or near a distinct gully that intersects the road. You should connect with the road roughly at coordinates north 28:14.051, west 016:35.165, this is about 900 meters from the summit of Topo de la Grieta, but your elevation has dropped almost 400 meter to 2130 meter. Once on the road, hike about 4 kilometer back to the trailhead. Comments: My GPS estimated the elevation to 2510m, and the saddle elevation to 2420m, in quite good agreement with the values given on the map. See also description of a nice hike to Sombrero de Chasna that I did with my family the next day. Topo de la Grieta, a very pointed peak. The rim with Roque de la Grieta 2575m, Montana de Guajara 2718m, and El Sombrero 2531m, in the far distance.